The Google Chrome web browser is slowly growing in popularity. This is no surprise, as it is a great browser, and is backed by no other than Google. It also provides great tools for web developers and I find myself using it more and more (actually Firebug is the only thing keeping me from crossing to the other side). With the introduction of extensions, Google Chrome became even more agile and powerful. In this tutorial, we are going to create a simple extension, which puts a small icon next to Chrome's address bar, and, when clicked, will fetch Tutorialzine's RSS feed and display a fancy preview of our latest tutorials. First a few words about extensions. The extensions are, however, treated a bit differently than your regular webpage, which is displayed in the browser. You can have access to all the opened tabs, to the user's browsing history, you can manipulate all the pages that are opened, send AJAX requests to any website and much more. You also have the benefit (or the limitation) that your extension runs only on one browser. You can forget all compatibility issues and embrace Google Chrome's hot new HTML5 features. Extension are packed in a .crx file (arenamed zip file) but during development, you can map your working folder as an extension. This way you can quickly change and deploy code without the need of repackaging. This is done by opening the extension page (type chrome://extensions/ in the address bar, or click Wrench icon > Extensions), and clicking Developer mode > Load unpacked extension.. on the page. After you make a change to the extension, just hit the Reload link below it. After you're done developing, click Pack extension.. and a crx file will be created for you. You can serve this file from your site and enable your site's visitors to install it. Google Chrome is by far the easiest browser to make extensions for, as you will see from the steps below. A note about debugging: To debug your extension, right-click on your extension's icon, next to the address bar, and choose Inspect popup. You can also check out this tutorial. The first step in creating an extension, is mapping a folder on your hard drive as an extension (as explained the above). You are going to put all your files in this folder. The only thing required from your extension by Chrome, is the manifest.json file. This is a text file, which holds configuration settings in the form of a json object. In this file we are specifying the name of the extension and a number of other options, such as browser actions and permissions. In browser_actions, we put settings that are in relation with the browser window. The popup property tells Chrome, that we are going to show tutorialzine.html as a popup. There are a number of settings you can put in browser_actions. You can read more on Google Chrome's Extension documentation. For this extension we do not need access to currently opened pages, nor manipulating tabs and windows. If we needed those, however, we would need to include a permissions property, with the addresses of the pages. For more information about the manifest file, refer to Google Chrome's documentation. 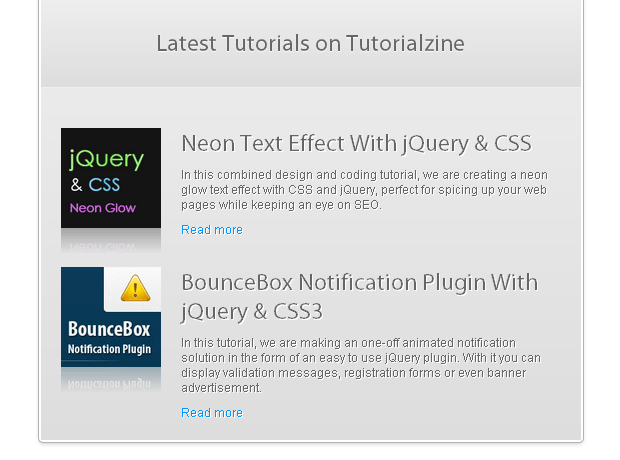 As mentioned above, we told Chrome that tutorialzine.html is going to be opened as a popup. This is a regular html file, complete with stylesheets and js files. And as Google Chrome has a really good support for HTML5, we can code tutorialzine.html in it. You could, however, use any HTML version you normally code your sites with. As you can see, we are addressing the css and js files directly. Chrome will include them for us. Just as if we are working on a regular webpage. As the extension is rendered Google Chrome, we do not need to limit ourselves with the least common denominator when it comes to CSS3 support. This is why we can afford to use fancy rules like -webkit-box-reflection and -webkit-gradient. -webkit-box-reflect creates a pure CSS reflection under the thumbnail images. It takes a number of parameters to generate the reflection - position of the reflection, offset from the bottom of the image, and a mask (which is defined with a gradient). In the second part of the code we are also using a gradient, but this time as a background for the h1 element. Clicking the extension icon has the same effect for the scripts on the page, as opening the page in a browser. Inside $(document).ready(), we fetch the latest results from Tutorialzine's RSS feed, with the help of Yahoo's YQL API. We've used this API a couple of times before, here on Tz. It allows us to use an SQL-like syntax to fetch data in a JSON format. After fetching the data, we generate the HTML markup and include it in tutorialzine.html. We also save it to localStorage as a simple caching solution. localStorage is a simple way to save persistent data (it survives between page loads). This makes the experience of using the extension a lot faster. In localStorage we also store a timestamp. We use it to determine how old the cache in localStorage is. If it is older than an hour, we ignore it and fetch the data again. Here is a sample of the data that is returned from YQL. This structure is made available to us in the msg variable on line 11 of script.js. With this your first Google Chrome extension is complete! You can read more about extensions (including advanced features not covered in this tutorial) on Google Chrome's Extension documentation page. I hope that this tutorial has given you a great start in extending the browser's functionality. What do you think? Would you make a Chrome extension for your website? Excellent tutorial and very intriguing content! The outcome is pretty neat - just installed it - looks fabulous! how would I get the pictures from my wordpress blog? I can't get it to work. Thank you for the comments folks! and this is why I extracted the id from the guid (you can see it on line 27 in the sample YQL response at the bottom of the tutorial). If you choose random names for the post thumbnails, I am afraid that you won't be able to show them this way as the feed does not contain any data about the address of the images. However, in step 3, you call it "styles.css"
The downloadable file is correctly named style.css. Great job..! Its really helpful for beginners. I will study and create my special extension for Chrome. How could I display them with this type of link? The address of your thumbnails cannot be determined from the feed, as your thumbnail images use keywords in the filename (and not just a post id). You can go a different path - you can create a PHP script to generate a list of your latest posts and upload it somewhere on your site. This script will read your wordpress database, and output all the html. The extension can fetch that page (instead of fetching the feed) and just insert the html in the #content div. Hello. Thanks for this excellent tutorial. I was just wondering i see some extensions with the icons inside the omnibar. So how to do that? Just what I was looking for - thanks for the tutorial. Did you switch over to Chrome yet? I have just recently (firebug included) and love the speed / memory that chrome runs with. There is problems with some extensions still being ported over to Chrome but they don't outweigh the problems I had with Firefox (huge memory footprint, crashed at least once a day) . I will try to create my special extension for Chrome. Wow, it was so easy. I didn`t expect to be done with the tutorial in 5 only minutes. You did a perfect job by animating people to learn. Thanks. I use the SEO Site Tools extension on chrome. You must click on the extension's icon to get it to provide SEO metrics for the currently loaded page. What I'd like to do is create an extension that gets it to popup with metrics when I mouseover a link that exists on any given page. It seems easiest to do by writing my own extension rather than editing the existing .crx. I understand js basics but am having trouble understanding how to get this to execute. Ideas? Thanks! '"manifest_version": 2' in the manifest.json could't break the popup html! Does it work for others ? Seems like there's a new API version. After adding '"manifest_version": 2' still nothing happens. We have a few problems in this tutorial. Google has actualized the API, and it may just not work for some developers. Refused to execute inline script because it violates the following Content Security Policy directive: "script-src 'self'". Thanks for writing up this tutorial man - gave me the guts to try making a Chrome app myself!